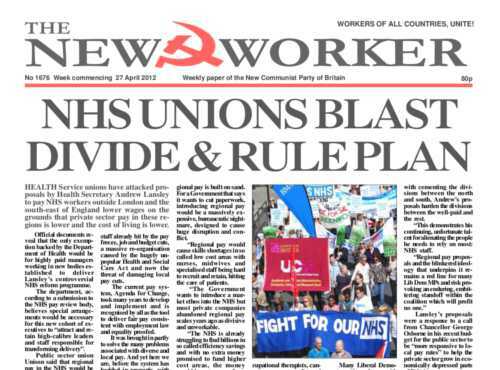 HEALTH Service unions have attacked proposals by Health Secretary Andrew Lansley to pay NHS workers outside London and the south-east of England lower wages on the grounds that private sector pay in these regions is lower and the cost of living is lower. TWO CHINESE officers have arrived in Syria to join the first team of United Nations observers preparing the ground for the larger 300-strong mission of monitoring the shaky cease-fire brokered by UN special envoy Kofi Annan. FRENCH president Nicolas Sarkozy suffered a humiliating first round defeat in the presidential race, beaten into second place by the Socialist candidate who now looks set to win outright in next month’s run-off. Sarkozy, the leader of the conservative Union for a Popular Movement (UMR) now has the dubious honour of being the first incumbent president to lose the first round contest under the constitution of the Fifth Republic, established by General de Gaulle in 1958. How the imperialists raged and wailed at the United Nations when Democratic Korea prepared to launch a satellite into space a couple of weeks ago. How they gloated when it sadly failed. The Nato powers and the rest of their lackeys falsely claimed that Democratic Korea’s satellite launch was a cover to test a ballistic missile. They claimed this was a breach of UN agreements and a threat to peace in north-east Asia and drummed up a diplomatic furore to justify the continuation of the US-led economic blockade of the DPRK.